I LOVE snow. There’s just something about it. Yes, people seem to lose their common sense the moment it’s on the weather report; yes, it makes parking in my neighborhood a nightmare; yes, it challenges my poor tiny car. Still, when snow falls, it ignites some kind of mysterious magical feeling for me. It muffles the sounds of the city and coats everything in a layer of fresh white. Whenever it snows, I like to go watch it at the window like a cat (strangely, not the only thing I find in common between myself and a cat, but that’s something for another day). The saddest part of my office at work is that there’s no window, so I can’t see what’s happening with the weather. And I can’t see if it’s snowing! 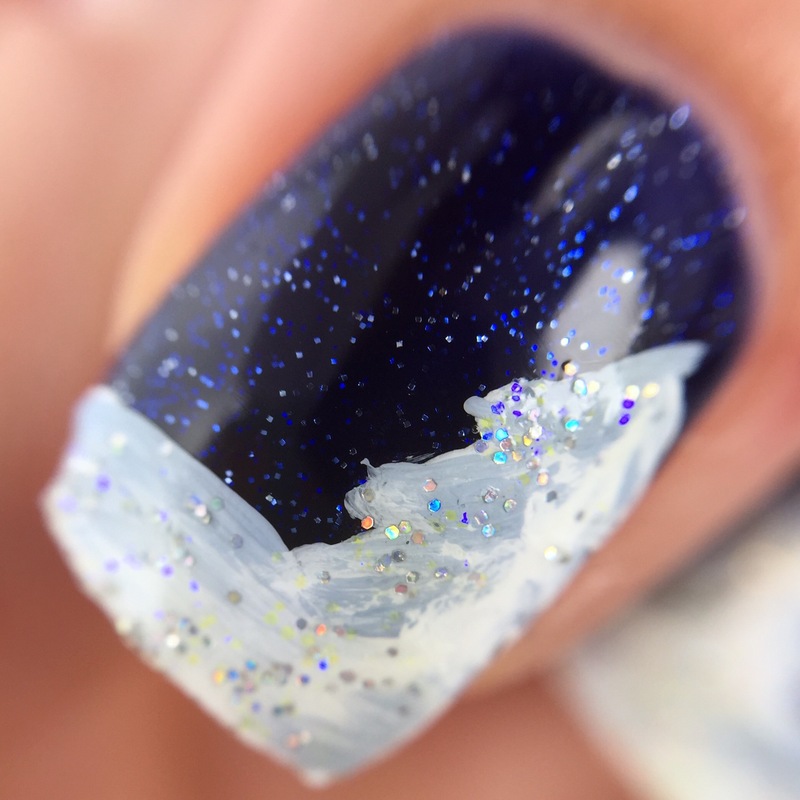 This mani is inspired by quiet snowy nights and wintry landscapes. I started off with two coats of Colors by Llarowe’s “Twinkle, Twinkle Little Star” (a dupe for the original Essie Starry, Starry Night). I love the glint of silver microglitter in the blue jelly. On top the dark blue background, I painted in a ground line and trees in shades of white and blue-gray acrylic paint. This is my first time using acrylic paint on my nails, and I’m not sure that acrylic paint is going to be my best bet for impressive nail art, but it was fun to experiment! Does anyone have any tips? I was a bit disappointed in how globby the acrylic paint looked, so I decided to keep adding on. (More is more!) 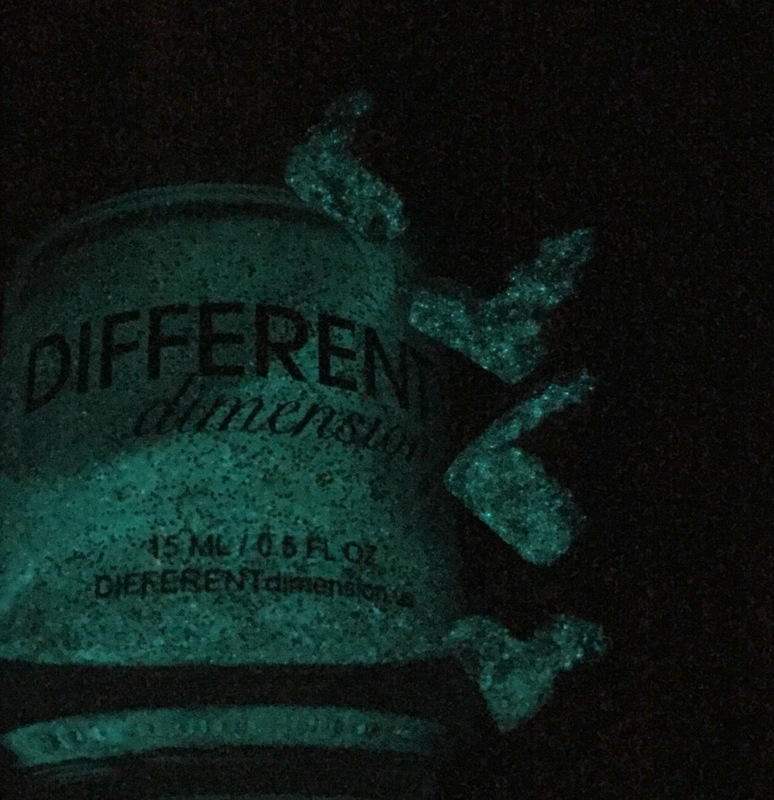 To spice things up, I added some Different Dimension “Imitation is the Most Sincerest Form of Flattery,” a silver glitter glow-in-the-dark topper. 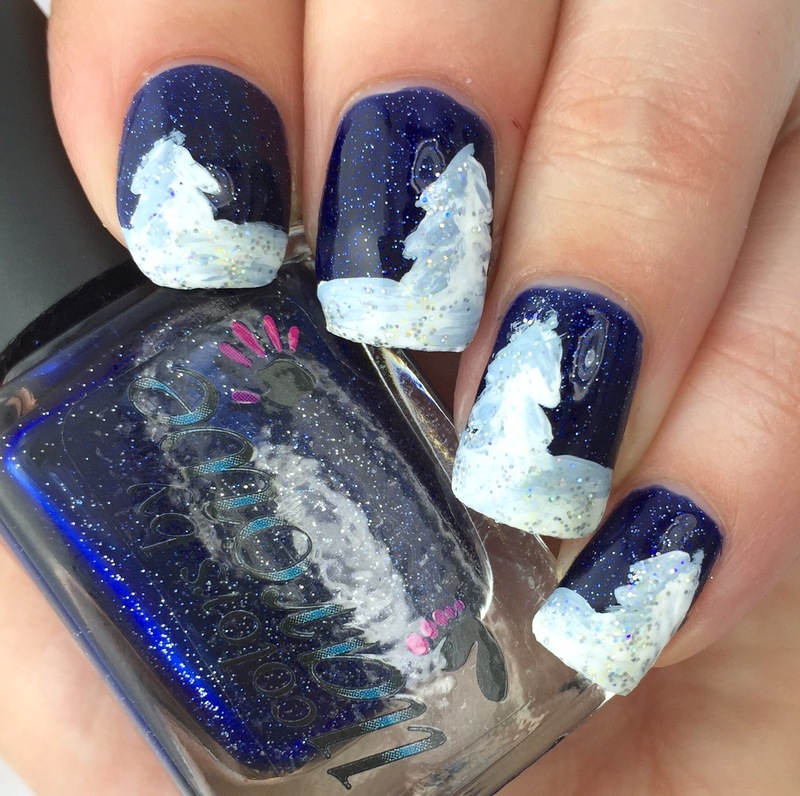 I figured that it went with the snowy landscape theme, since real snow sort of glows in the moonlight at night. In keeping with the theme, I only painted this over the snowy acrylic paint, hoping that it would look really cool in the dark. Good news! With a bit of googling, I discovered that even though I’ve had these polishes for several years (they’re some of my first indies- yay! ), these colors are still available! Win! 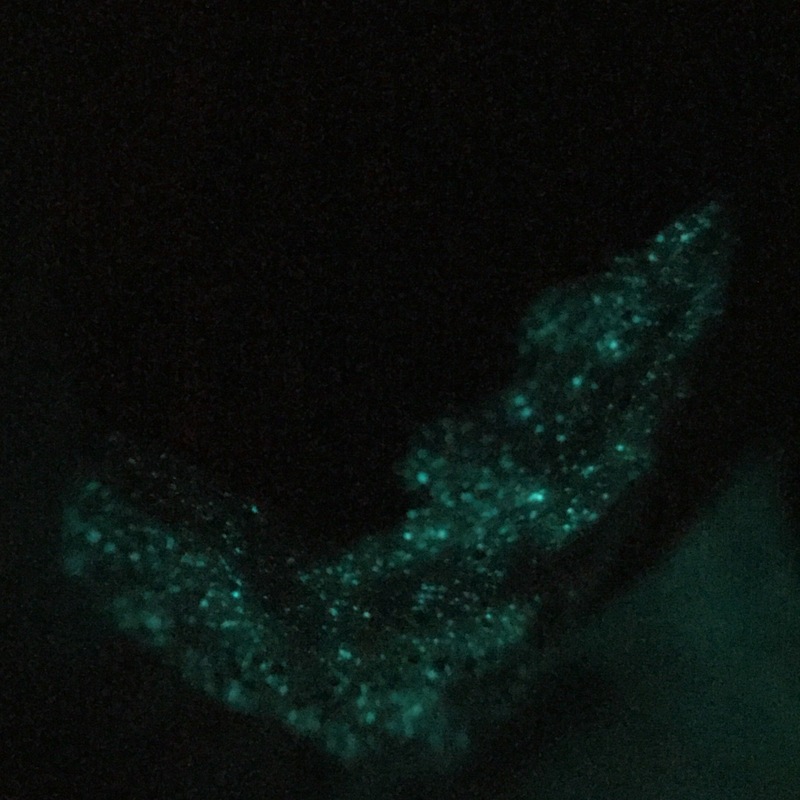 You can pick up “Twinkle, Twinkle Little Star” at Llarowe’s site and “Imitation is the Most Sincerest Form of Flattery” on Different Dimension’s site. Huzzah! I love this! So pretty and that blue is gorgeous. The blue Llarowe is gorgeous. 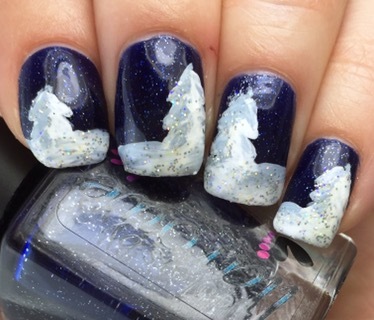 I love the touch of glitter to make it look like the snow is twinkling. I love the look of this in general, but I LOVE that it glows as well! How cool! We have only had snow here once in 100 years (seriously) but I’d love to see it more. This is gorgeous and I would have never guessed this was your first time using acrylic paint! In my experience, not all white acrylic paints are created the same. I either invest in a quality one or add a tiny little bit of water to make it easier to work with. This is also my first time seeing CbL dupe of Starry Starry Night. They did a great job! 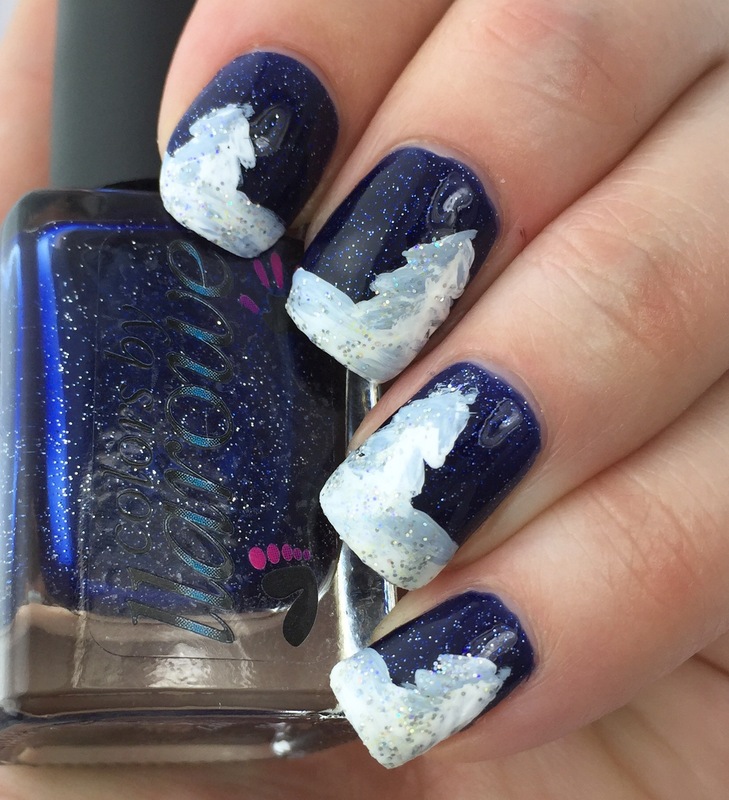 This manicure is beautiful – the glow in the dark is a great touch! I also like snow! We’ve had the weirdest winter here in Ohio. There is probably less than inch of the snow on the ground right now and it’s been really warm. I’m hoping for at least one good storm before spring arrives! I love the sparkles in the snow! I’m not sure what to tell you about acrylic since I just started using it on my nails. I guess I would tell you to not be afraid of mixing colors and really playing around with shades. OMG, that design is so amazing. Love the colors too! This is just so much fun!! I think this turned out so beautifully! You did a great job on these. This is pretty! it reminds me of a mani I did a couple of years ago! 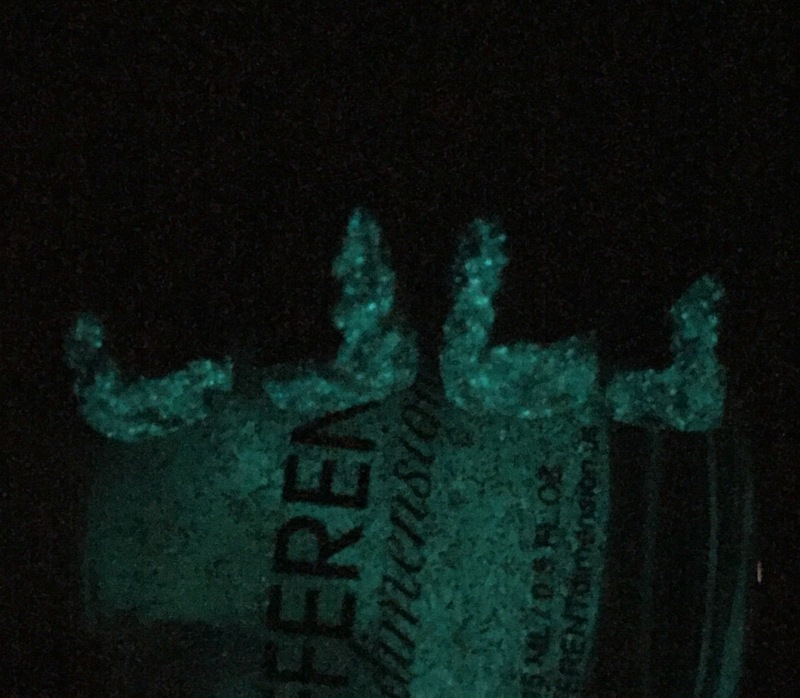 I love that it glows. Great job with this!